I have had an extremely hard time sleeping this past week or so. Sadly my body does not know how to turn off right now. I am grateful for my mother in law, who has been so helpful with Grant. Ruth I hope you know how much I appreciate ALL that you do, thank you!! I thought that I would put down some of my thoughts about being a new mom, in hopes that it will wear me out and I'll sleep!! I am reminded about a friend I met about 8 years ago. I recall asking if they ever wanted children, and the response was always the same, "No, we have our dogs". After I became a mom, I had come into contact with them, and I expressed how wonderful it is to be a parent. Again, our conversation came around to that same question, and again I got the same answer. My heart sank as I thought about the love that they would be missing. It wasn't until Cami came along that I truly understood ALL the love that comes with having a child with a husband. Mark has been my better half. We have not known each other for years on end, but he is my best friend. He is the love of my life, and the person I go to for everything. He was worth all the pain I went through to find him. Holding Cami and seeing this little being that we created together, is incomparable. At church yesterday, I whispered in Mark's ear, "She is both of us". And she is. She is a product of our love for one another. Please don't get me wrong, I love Grant with every piece of my being. To me, he is all me... And strangely, he is all Mark too. I truly believe that Heavenly Father knew the things that would happen. He knew that Mark would be his daddy, and made him like him. I could not ask for a more perfect family, even if it is blended. But it is different having Mark around from day 1. 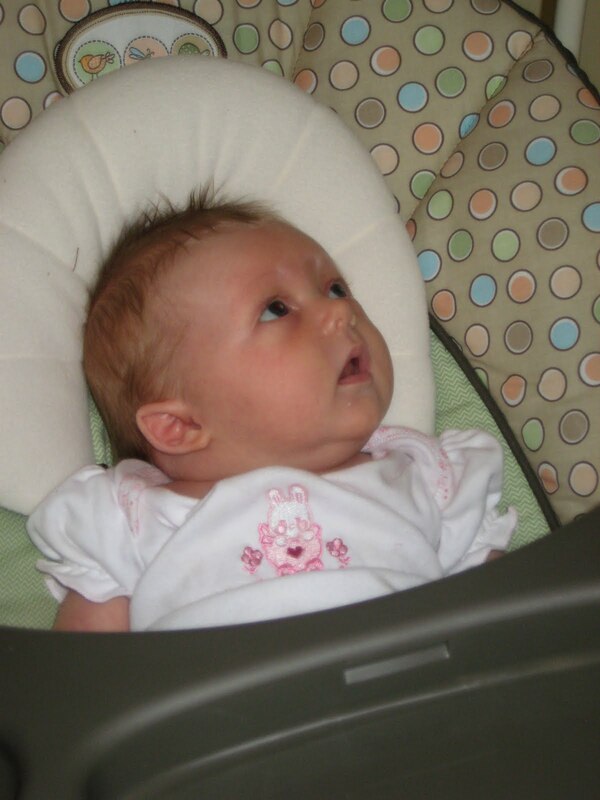 I took this picture of Cami while she was in her swing. She often times sets her sights on one thing. However, that one thing isn't always visible to us. Mark and I wonder who she is looking at. I hope that is my Grandma and Grandpa Summers, or Grandpa Thude. I love it!! Last week Megan had sent me a video of Marcus. I showed Grant the video and he began calling Marcus by name, without me saying it. Grant has a great memory!! But he kept crying, and wanting Marcus. Since we live 3 1/2 hours away, I knew it wasn't possible, so I called up Megan and asked to talk to Marcus. Grant talked on the phone for a good 20 minutes!! I am sure Megan had hung up by then, but he was so cute with the phone!! I love this little guy to death!